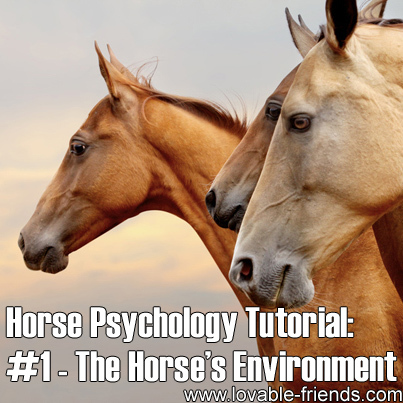 A horse’s environment will have a very great effect on his mental health. Understanding the horse’s natural environment can help us provide the most natural life style possible for horses to ensure their mental and physical health. We cannot turn back the hands of time and give horses what nature intended, but we can be creative and provide substitute activities and other things that fulfill the horses’ needs. The horses’ wild ancestors evolved in an environment that was suitable for their healthy survival. Only the strong survived and passed their superior traits to their offspring. They became accustomed to extreme weather conditions as they wandered 10 to 20 miles a day in search of food, water, and shelter. They had the freedom to play, explore and establish relationships. Some wild horses lived a long life but many died young. I believe freedom was more rewarding than longevity. When horses became domesticated, their life span was shortened. Lack of natural selection allowed them to develop defects and illnesses. For instance, colic, navicular disease, founder, respiratory illnesses, thin-walled feet and crooked legs, became more common. These problems were almost unknown in wild herds because those weaker individuals died off or became prey before they could reproduce. Breeders of domestic horses were either careless or unaware and encouraged the spread of certain undesirable traits that would never have survived in the wild. In some ways, today’s horses are not as fortunate as their wild predecessors. Even well-meaning owners err by not considering, and compromising what is necessary to keep horses healthy and content. Because owners are legitimately concerned that their horses might get kicked, they deny these very sociable animals the companionship of other horses. Some are subjected to live in small box stalls and are denied grazing, exercise and play time which normally would comprise almost all of the horse’s time. After a horse becomes accustomed to isolation and small living quarters he may even develop a neurotic fear of other horses and areas. A stalled horse will most likely become ill if turned out in rainy weather. We have, in a sense, weakened the horse psychologically and physically. Most stallions (non-castrated male horses) are victims of this isolation. They may appear healthy and beautiful but they are often psychologically unbalanced by the lack of a more natural environment. It is not surprising that a mannerly, friendly, well-behaved stallion is the exception rather than the rule. Imagine yourself living in a tiny room, with little play time or running time to stretch your legs except when your keeper permitted, no free choice of food, few or no visits with pals, etc. I think most of us would be in need of a psychiatrist after a few years. What’s the solution? (a) Exercise: Substitute a horse’s natural approximate 10 mile a day travel by either riding or “ponying” him (leading him from another horse). Horses can be routinely turned out into a large area, put on a mechanical walker or a treadmill or they can be “longed”. If you do not have time to do this, consider sponsoring your horse(s) out to a reliable person who has time, or hiring someone for the task. (b) Communication, care-giving and care-receiving time: Horses need to communicate, care for, and receive care from other horses. This can be seen when they stand side by side to scratch each other, and stand head to tail in order to swish flies from each other’s faces. If you allow your horse to develop relationships with other horses, make sure all horses involved do not have transmittable diseases, and are up to date with de-worming and vaccinations. When keeping horses loose with others there is always a chance of them hurting each other, especially when there is a new horse and they are trying to establish dominance. To decrease the danger it might be best to initially pasture them near each other, not together. If kept side by side, make sure that the fence between them is strong and extremely safe. Put them together only after they have become familiar with each other. If there are several horses it might be best to put them together one at a time. If you decide to not take the chance of horses getting hurt, keep them separate but then you must be the one to substitute for your horse’s need to receive care. How does one substitute for a horse’s need to receive care? Most of the things we do to care for them such as fixing the fences, administering medication, shoeing them, bedding their stalls, etc., do not tell the horse that we are caring for them. They cannot reason things out that way. Instead, we must show them hands on care through things like grooming, rubbing, and petting. They need to feel our care-giving to recognize it. (c) Company: If there are no other horses around, a goat or some other suitable animal can provide company for your horse. Some people have purchased or adopted a wild horse or burro at little cost. They make good companions. If you get a small horse or a burro, they don’t eat as much as an average sized horse, and you don’t have to ride or shoe them. Certain stallions can be slowly introduced to being kept with geldings (castrated male horses) as long as no mares (female horses) are close enough to fight over and the fencing is sufficient. I have kept some gentle stallions with mares that he has impregnated (as long as the mare was past her first trimester of pregnancy). Sometimes the aggressive behavior in horses, particularly stallions, is so ingrained that it may be dangerous to put them with other horses. I advise expert supervision in this area. Whatever you do, keep in mind that it is very unnatural for horses to be alone. Some horses become too attached to one another which can cause problems when you ride or separate them. Sometimes having no stable mate is safer for you and the horse. Perhaps you can be the substitute for the horse’s need of a companion by spending time with him, not necessarily working him. (d) Play time: Horses love to roll in dirt or mud. Some love to paw and splash themselves with water. Others like to play with tether balls and other objects. These things should be allowed to enhance their happiness and help ensure that they will not do these things during work time. Running together with other horses and bucking are favorite activities. (e) Grazing time: It is natural for horses to nibble on food and graze all day long. Their digestive track is designed for it. If your horse doesn’t get much time to do this, try feeding some roughage hay such as oat or grass hay once a day between his two meals. Unlike alfalfa and clover which are very rich, certain oat and grass hay can usually be fed generously between meals thereby giving bored horses something to do. There is very little risk of founder with this “non-rich” hay, but watch for weight gain. Helping to prevent boredom also helps prevent fence chewing, stall weaving, and other vices. If my horse does not get grazing time naturally, I provide the time for her when I go riding out on the trail. I remove the bridle, put the halter on, and let her graze for a while. This makes her work time more pleasurable and enhances our partnership. On the other hand, wide exposure to early bloom alfalfa may also bring adverse effects to the health of horses that are lightly-used. Horses may overindulge themselves to this hay which may result in weight problems. This is one of the important reasons why proper choice of feeds, especially hay, is important when raising horses. There are several types of hay which can be fed to horses. These include timothy hay, Bermuda grass hay, oat hay, alfalfa hay, as well as grass and clover hay. However, nutrient value is essential when selecting the type of hay to feed. 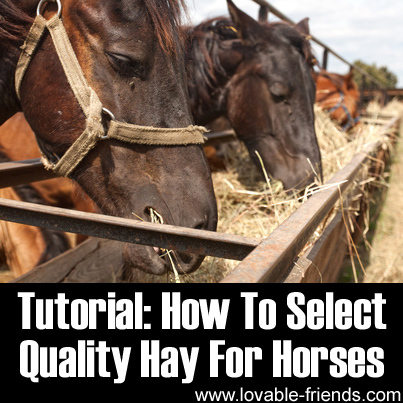 There are several factors which need to be considered when evaluating the quality of hay to buy. Some of these factors include the stage when the hay was harvested, number of leaves and stems present, as well as freedom from weeds, molds, and dust. Other factors to check for include color, smell, age, weight and texture. Normally, good quality hay is pale green to pale gold – but note that the interior of the bale, rather than just the outside hay, should be checked out. The hay should also emit a fresh and pleasant aroma. A moldy smell is not good and mold can harm the horse. A trail ride sounds fun and exciting but without proper saddle fitting, it can be a huge discomfort to horses. A saddle can protect riders from falling, but if placed improperly, it can be detrimental to the physique and overall health condition of horses. But how do you actually saddle a horse? This article serves as a primer on how to do it. Before saddling the horse, you will need items such as the saddle pad, and horse brush. First, you need to brush off the loose hair from the horse’s back. When the horse sweats under the saddle, unremoved loose hair will get wet and feel uncomfortable to the horse, so the horse will try to shake it off. Not such a good thing when you are on a ride. Also, you need to brush off all dirt and dust from areas which the breast collar, saddle pad, cinches, blankets and saddle will cover. Second, all items (especially the sharp ones) should be removed from the inside of the saddle. Check the presence of hard objects in the fibers. When present, they can cause a lot of discomfort to the horse. When placing a saddle, it should be done in a way that the rider’s weight will be evenly distributed across the back of the horse, or else, your horse will suffer. When a saddle is not placed properly, clinical signs such as sore, pain and white spots may begin to occur. Always bear in mind that a properly fitted saddle can spare horses from discomfort, and of course, protect the riders from falls which may be triggered by improper saddling. When placing the saddle, the horse must be tied with a lead rope and a halter. Make sure to have full control in placing the saddle on the equine’s back. Put the equipment as gentle as you can instead of thumping it hard on the back. This way, you make the process of saddling gentle and comfortable for the horse, so putting on the equipment next time would not be difficult for you. What you have learned so far are just some of the most basic tips before placing the saddle on the horse. Want to know how to place a saddle on the back of the horse correctly? Check out the video below to discover how it’s done correctly.